Also Known As – Achillea millefolium, Common Yarrow, Milfoil, Soldiers Woundwort, Staunchweed, Woundwort, and Western Yarrow. Overview - Yarrow likes full sun and will grow almost anywhere. 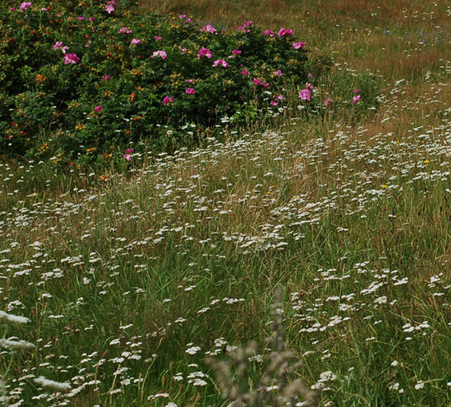 These meadow plants can grow as high as five feet tall. With hairy stems, feathery leaves and sporting a flat sheaf of tiny flowers, it adds a distinctive look to any garden. Medicinal Uses – Internally, Yarrow has been shown to be effective for many ailments including liver and gallbladder problems, digestive upset, loss of appetite, menstrual irregularities, cramps and pain associated with the menstrual cycle, muscle spasms, fever and infections. It can also increase the urine flow. It has also been used to deal with amenorrhea to induce bleeding, colic, Crohn's disease, cold and sore throat, abnormal Pap smears and colitis. Externally, Yarrow can also stop bleeding merely by holding a leaf against a wound. It can help wounds to heal and help with inflammation. The herb makes a nice facial steam treatment and it helps oily hair. Other Uses – When added to a compost pile, it has the characteristic of speeding up decomposition of food and other garden and household waste. It is used in pot pourri and as dried flowers for arrangements. Herbs to Combine/Supplement - Combine with peppermint and elder flower to use against a cold or flu. Parts Used - All of the above ground parts of the plant can be used for medicinal remedies. Precautions - Allergic reactions may occur when using the herb, similarly cosmetics made from the herb might have the same effect. If you are sensitive to feverfew, chrysanthemums, chamomile, ragweed or Echinacea, exercise caution when taking this herb. Pregnant women should not use internally as it may cause bleeding and possibly miscarriage. When breastfeeding, yarrow should be used sparingly. There are no reports of drug interactions. Preparation and Dosage - It can be found in many different preparations like capsules, tablets, tinctures, liquid extract and dried or fresh herb. For an herbal tea, pour 1 cup of boiling water over 1 to 2 teaspoons of dried yarrow. Allow the mixture to steep for 3 to 5 minutes, then strain before drinking. This can be taken up to three times per day. If you prefer capsules, take the 2 to 4 grams of the dried herb three times per day. With an extract, you'll want to take 20 to 120 drops up to three times per day. For a tincture, begin with 40 drops three times per day. If this is not enough to be effective, you can raise the dose up to 120 drops. Dried yarrow can also be steeped to make a sitz bath. Add 3 to 4 ounces of dried herb per 5 gallons of water to make the bath. Great shipping time and good quality herb. Shipping overage was refunded promptly as well. Will reorder when needed! The yarrow is beautiful, and I have enough to gift my mother! Thank you! High quality; super fast shipping! Quick shipping and fresh herbs! Thank you! Click the button below to add the Yarrow Flowers to your wish list.